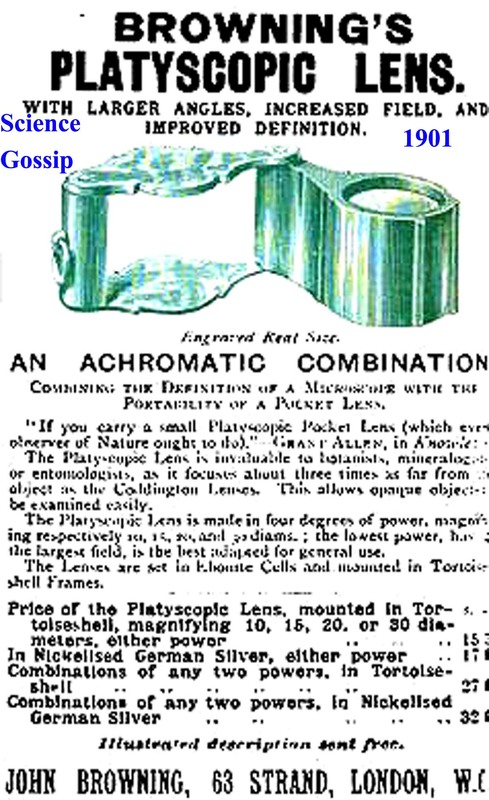 Folding pocket-sized single lens magnifiers have been sold for centuries and are still sold today. Early on, magnifiers of the type shown on this page were called 'botanical' magnifiers. 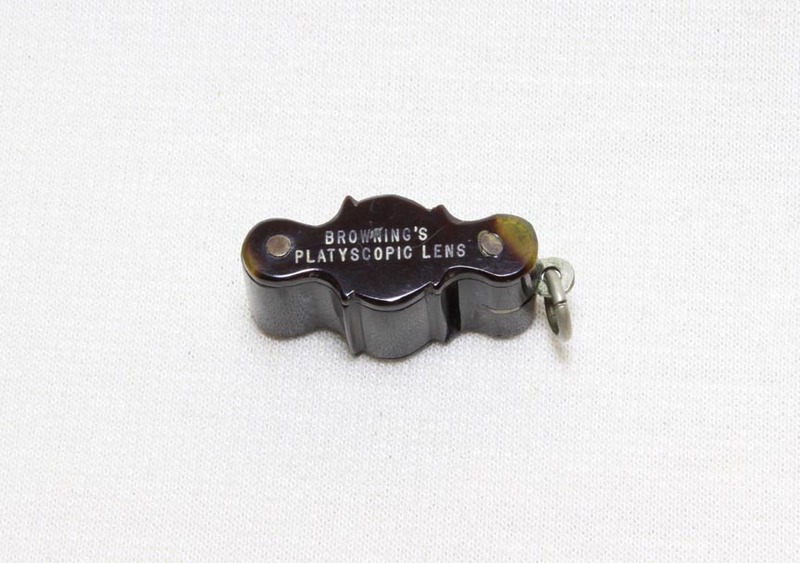 Starting in the early 20th century they were often referred to as 'Loupes' although the instrument used by Jewelers is more commonly referred to as a loupe. 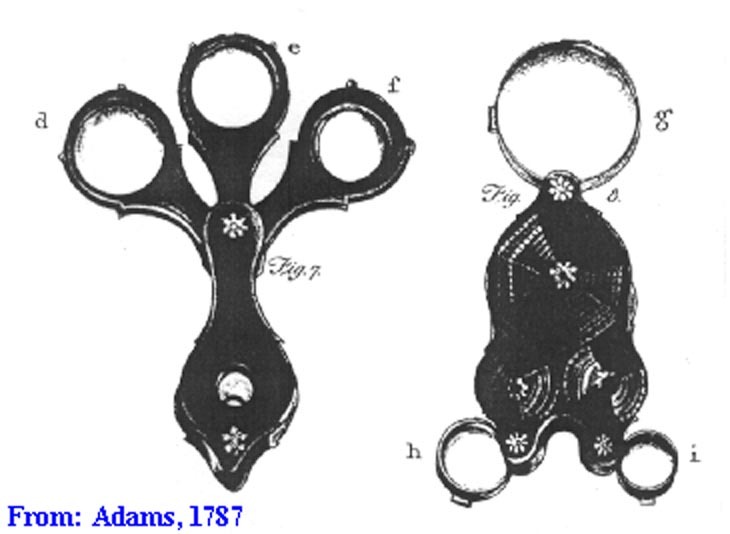 As can be seen in the illustration to the left, magnifiers very similar to the later ones shown on this web page were sold by George Adams, and were pictured in the plates for his 'Essays on the Microscope' of 1787. They were likely housed in cattle horn. 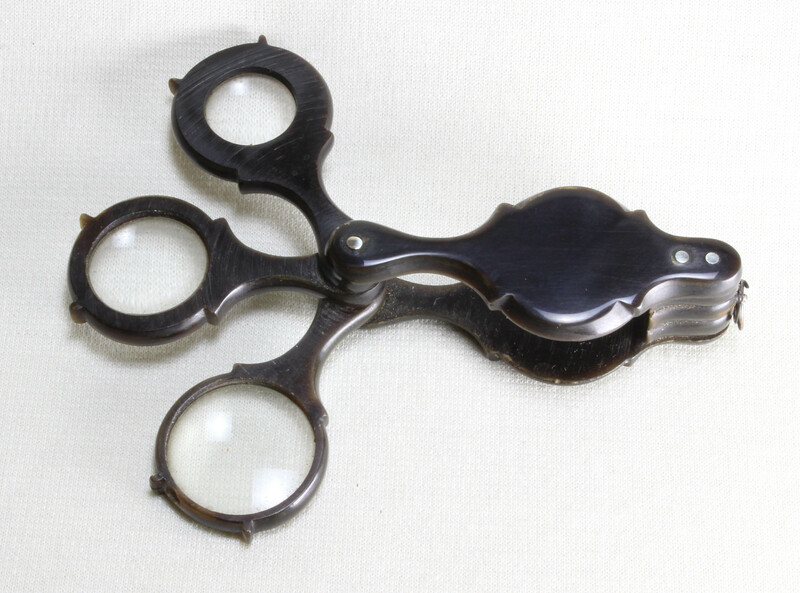 In 1848, a magnifier almost identical to the one shown here was sold by Pike, and likely many other retailers. This three lens device is most likely made of cattle horn. The lens enclosures are about 25 mm in diameter. The entire device measures 61 mm in length, and 100 mm when the lenses extend straight out. There are three different power lenses, the one of highest magnification having the smallest diameter. As is stated in Pike's description they can be used singly or in any combination to provide seven different magnifications. The spacer on the end not attached to the lens housings is made of three layers. This differs from the next example which has a single solid piece as a spacer. This magnifier is nearly identical to the entry above it. This three lens device is also likely made of cattle horn. The lens enclosures are about 25 mm in diameter. The entire device measures 61 mm in length, and 100 mm when the lenses extend straight out. There are three different power lenses, the one of highest magnification having the smallest diameter. They can be used singly or in any combination to provide seven different magnifications. With all together inside the main casing, a hole permits use of all three at once, while stopping the lens down a bit to reduce distortion at the edges. The two differences from the preceding entry are the fact that the housing for this one has holes which allow the three lenses to be used together enclosed, and that the spacer on the end not attached to the lens supports is a solid piece of material rather than layers. This magnifier, instead of having stacking lenses, has one on each side. It measures about 85 mm long when closed, 138 mm with both lenses extended straight out. The instrument is about 13 mm thick. The casing for the larger (lower power lens), is about 33 mm in diameter, while the smaller (higher power) lens casing is about 20 mm in diameter. Although this example is likely also made of cattle horn, the same basic design in hard rubber was offered by Queen in the last quarter of the nineteenth century. 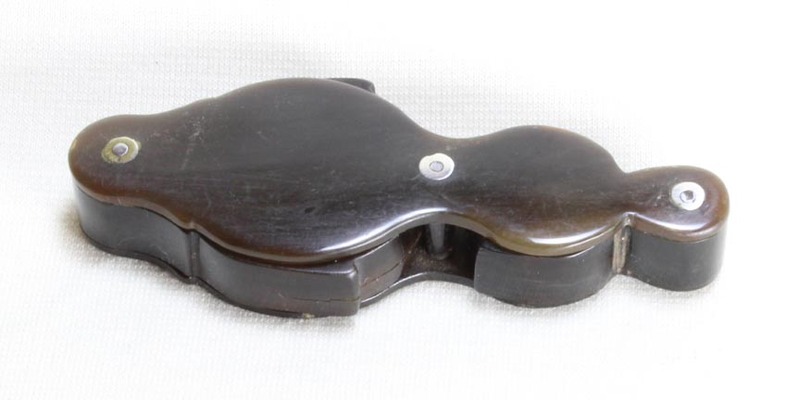 Although before 1875 John Browning had sold simple lenses and Coddington Magnifiers, in 1875 he started to market and sell a unique group of aplanatic, achromatic triplet magnifiers in this form of casing which he called his 'Platyscopic Magnifier'. 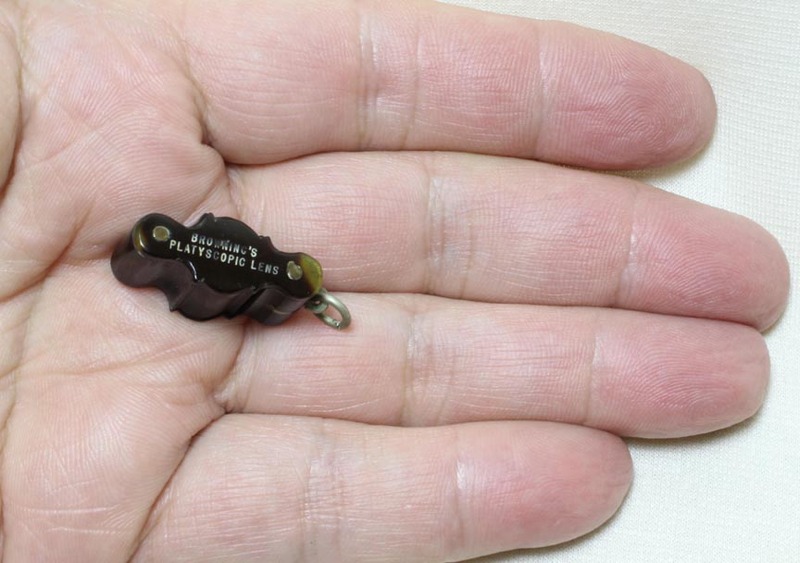 This tiny example, is his highest power, and measures only about an inch (25 mm) in greatest dimension when closed. Open it is 1 1/2 inches (38 mm) long. It is little more than half an inch (14 mm) high. The lens casing has a 5mm diameter. 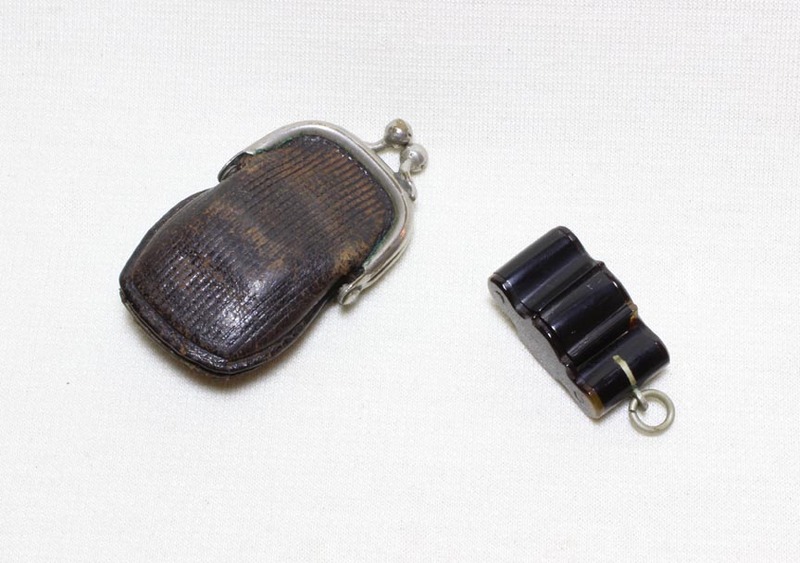 The purse-like case measures about 2 X 1 inches (25 x 50 mm)measured from the tips of the clasps to the far end. The outer casing is made of high quality tortoise shell, the lenses mounted in Ebonite (hard rubber). 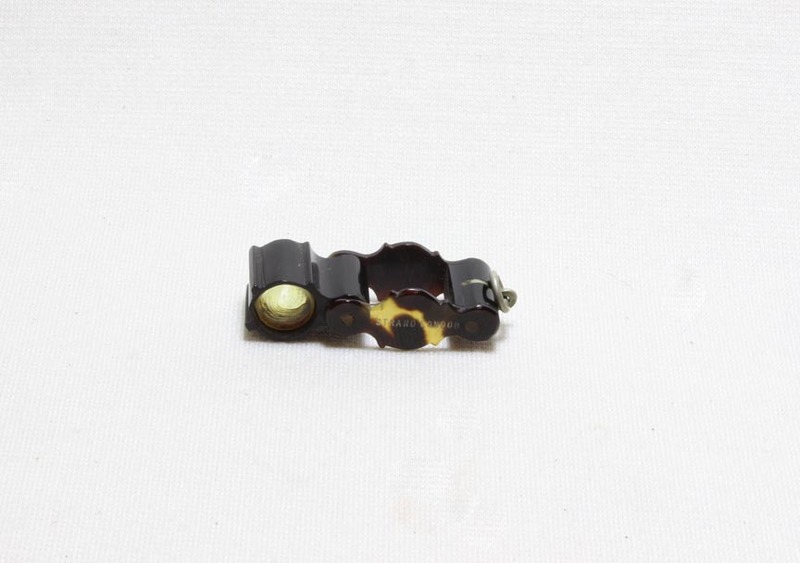 The outer 'tortoise shell' casing is less than 1 mm thick. 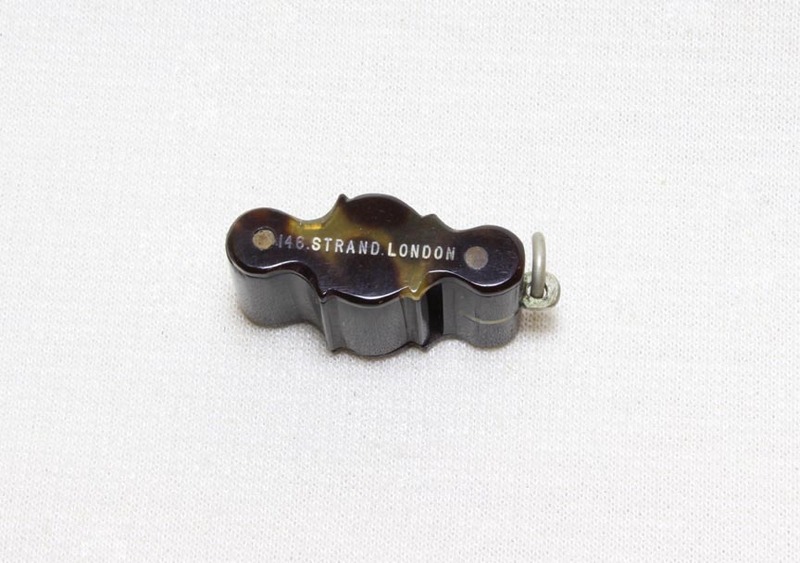 It is signed in gold letters on one side: 'BROWNING'S PLATYSCOPIC LENS' and on the other: 'STRAND LONDON'. This is a 30 power instrument, and has a field of view of only about 2 mm. 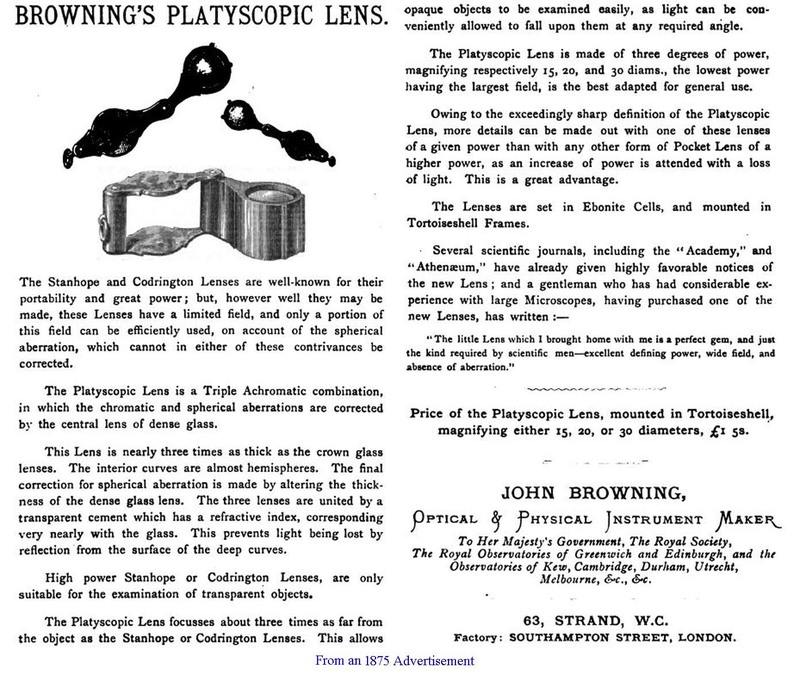 This small field of view may be related to the partial decementing of the optics at the edges of the lenses, because Browning claimed the field of view to be much larger than this (see chart in the ads below). The 'platy' was initially offered in three powers. These were 15, 20, and 30. 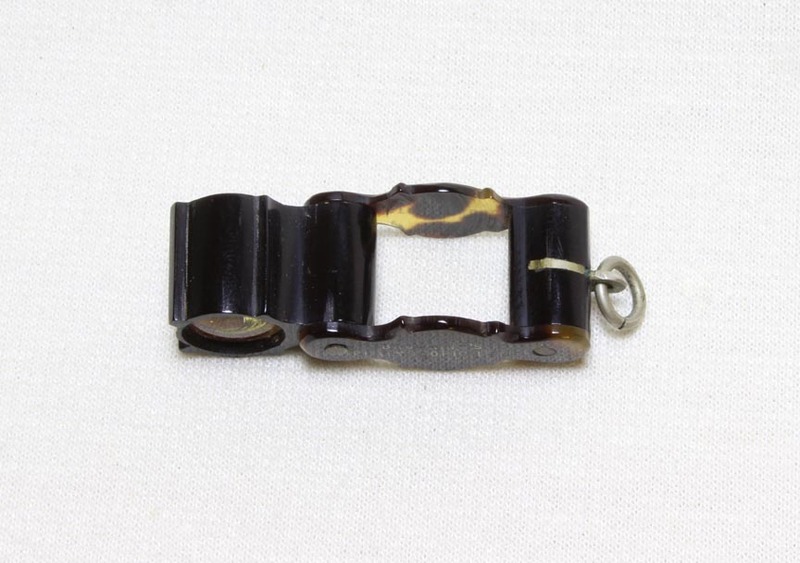 The outer casing was made of 'tortoiseshell' while the lens was housed in hard rubber, also known as 'Ebonite'. 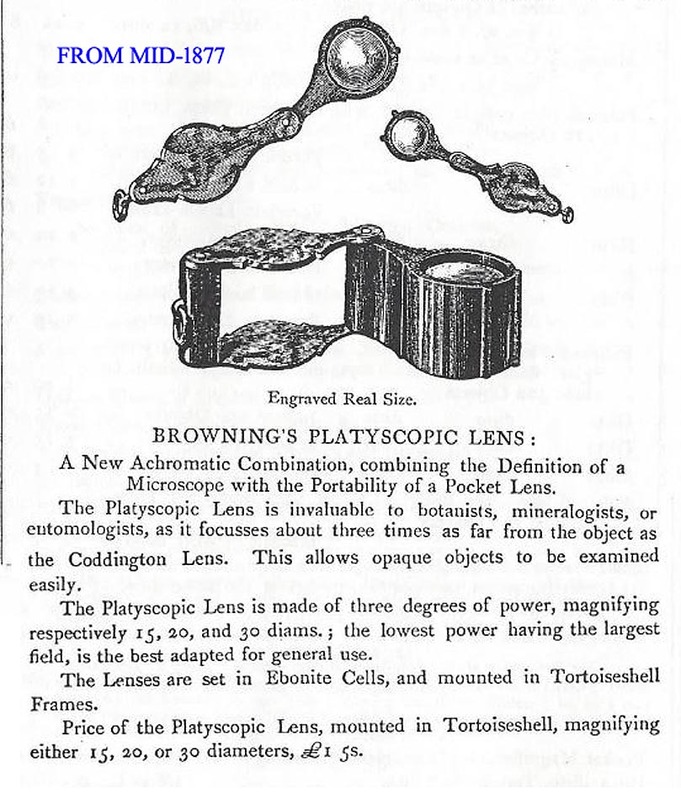 The Browning Platyscopic magnifier was first noticed in the Monthly Microscopical Journal of 1876. In the early years of production the instrument was only available in its original form, the three original magnifications, and in its original tortoiseshell casing. By 1879 the 'platy' could be ordered in the original 'tortoiseshell' casing or in pure silver. It was still offered in only the three original magnifications. In 1881, it was announced in the JRMS that Browning had added the 10X magnification to his offerings. 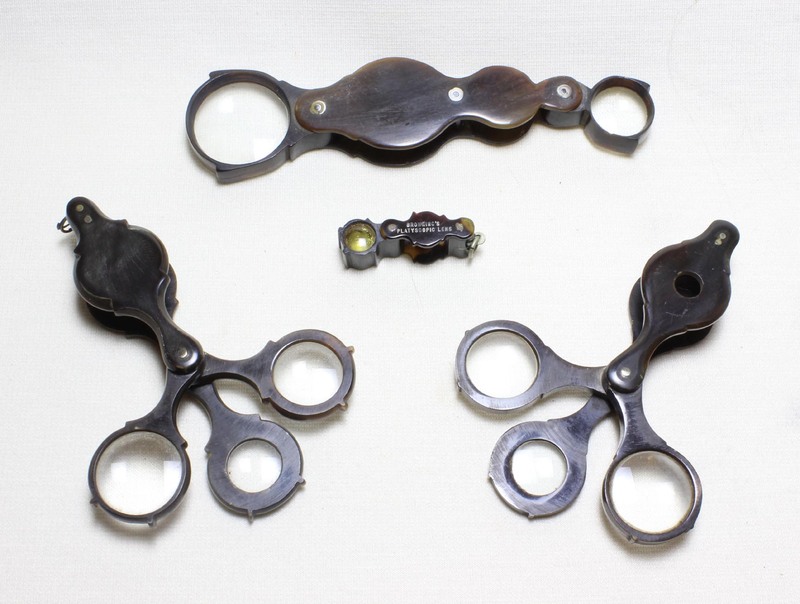 By 1901, Browning was also offering these in a German Silver casing, and with an option to have two different magnifications in a single instrument, one on each end. He also started to offer one lower power, now recommended for general use, the 10X. Today a 10X magnifier is the most common power loupe used. After 1903 he recommended the German Silver casing as more durable. In Browning's 1923 offering(right), there were now five different powers, including the 6X, and by then they were only offered in 'metal mounts.' 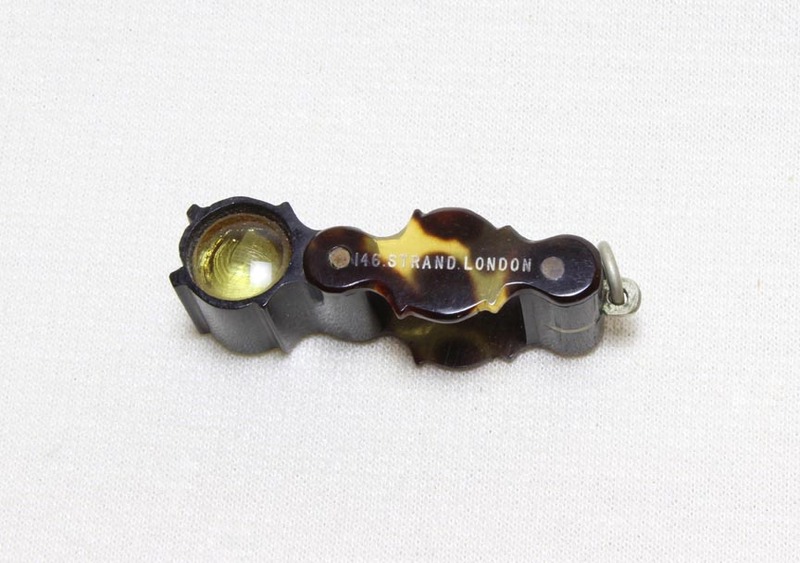 According to Davis (1889), this design of aplanatic loupe was introduced to England in 1872 and by 1889 similar aplanatic loupes were made by Steinhill(Zeiss), and Miller of New York. The German lenses were cased in metal. 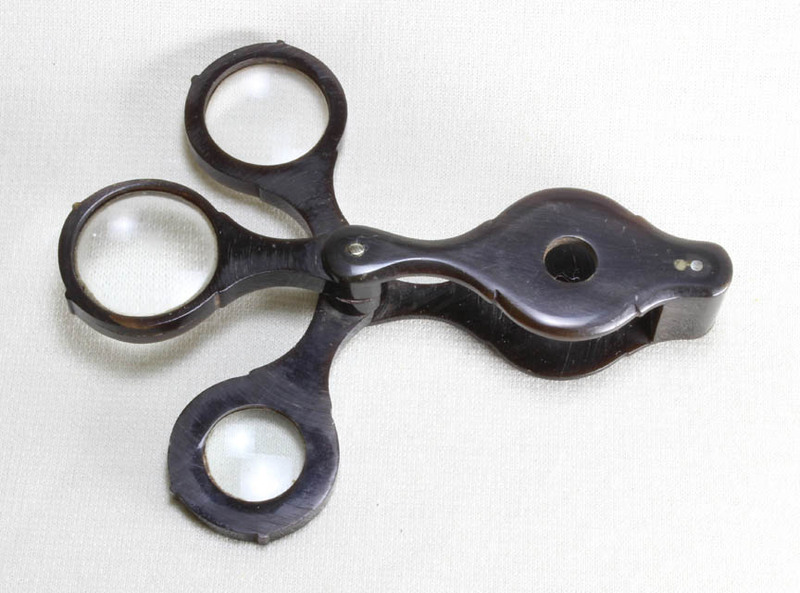 In 1880, Meyrowitz of New York City sold a similar magnifier 'cased in hard rubber.' 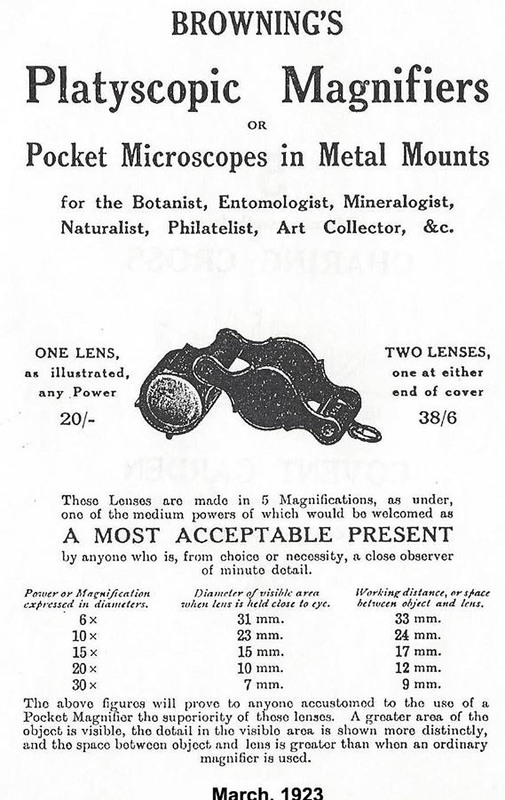 In 1890, the Queen Catalog offered a variety of 'Pocket Glasses in Hard Rubber', but also offered an Achromatic Triplet in either *tortoise shell or, for higher prices, in nickel plated, silver or even gold cases, and in 1915, G.W. Huntley of Chicago was still selling 'Rubber Case Magnifiers'. 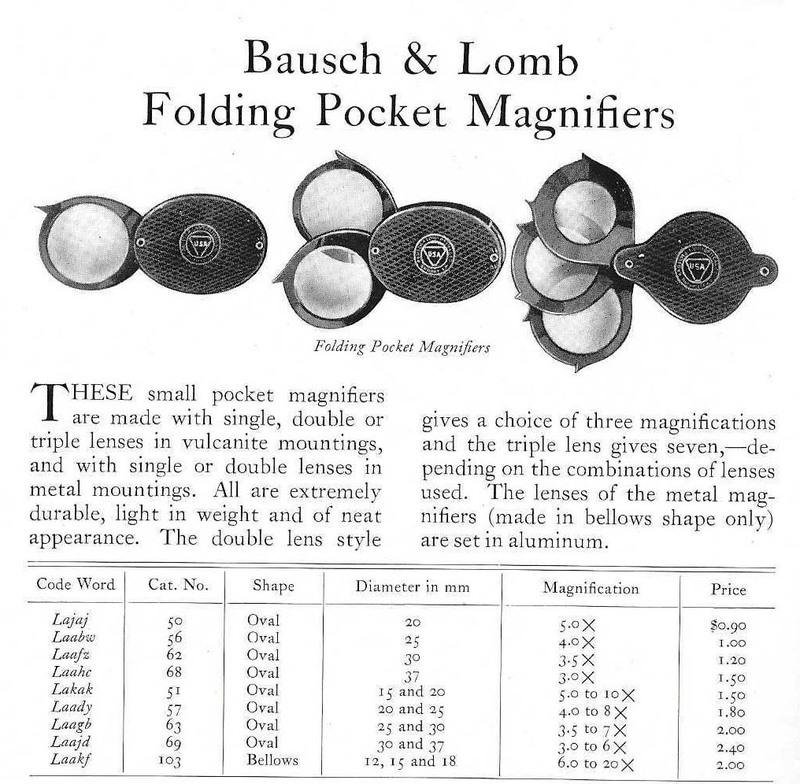 Hard rubber-cased folding magnifiers of this basic form were still being sold in 1929 by Bausch & lomb, albeit with a slightly more modern look. Today they are sold in plastic cases. B & L continued to make these in the later 20th century, and continues to sell Coddington Magnifiers as well as Hastings Triplets to this day. 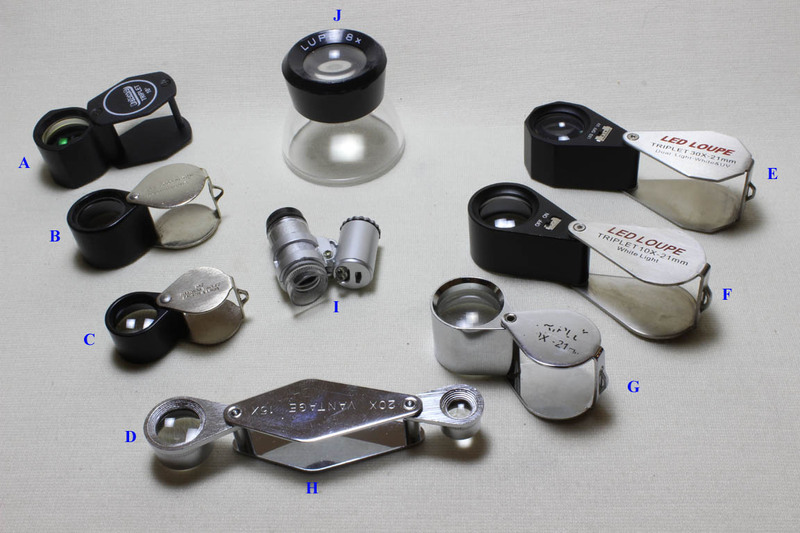 From the twentieth century and now in the twenty first century, folding pocket magnifiers with simple lenses, Coddington lenses, and Triplet lenses are still sold. Today they usually have a chrome or nickel plated case and a plastic lens casing, but some are cased entirely in plastic. Some newer models (e.g. E, F and I), even provide built-in miniaturized illumination with LEDs and button batteries. Some, like H, provide a variety of lens choices. Bausch & Lomb still makes the basic three-lens combination magnifiers, Coddington Lenses (B), and Hastings triplets(C). The Belomo brand from Belarus(A) makes an an even better excellent triplet magnifier as well. These triplets are achromatic flat field magnifiers but depending on magnification can still suffer from some degree of aberration or distortion, especially outside the center of the field and especially at higher powers. During the twentieth century, Agfa, a company specializing in film and photography apparatus marketed the 'AGFA LUPE". This magnifier (J) was made completely of plastic, and despite that delivers descent views at the 8X low power. A small 30X microscope with a built in LED side illuminator (I) has a clear plastic side rest to allow it to be held steady at this high power while it is touching the surface next to the object being observed. It has a focusable lens system and the entire thing is cased in plastic. These are available from China at rediculously low prices. The 30X triplet(E), not only has a built-in white light source, but also UV to allow further detailed evaluation of gemstones and other florescescing materials. The magnifiers seen here range in price from about $4 to about $45 (2016 prices). Nikon and Zeiss also market triplets costing up to about $100 each without built-in lighting. Not having the courage to buy one of these, I cannot say if they are superior to any of the others here, especially the Belomo, which for about $32 is hard to beat. The casing for these instruments was originally made of horn, occasionally then *'tortoiseshell,' then Hard Rubber(aka Vulcanite or Ebonite), then metal, and eventually, in the later twentieth century, ordinary plastics. 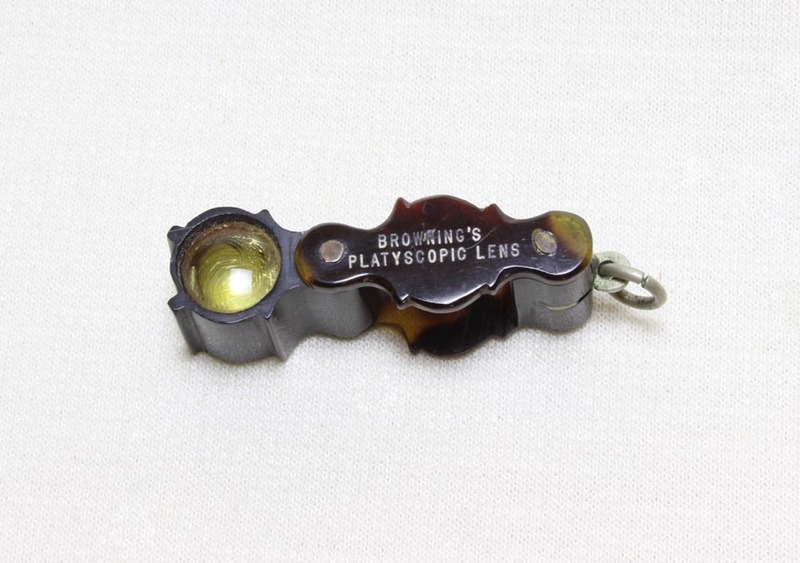 Browning's Platyscopic originally had its outer portion made of *'tortoise shell' and the lenses mounted in Ebonite. Later Browning offered a choice of the old form with a *tortoise shell casing, or a model encased in German silver (nickel silver). The 1929 B & L catalog still listed them in 'Vulcanite' housings. The use of hardened rubber was pioneered in the 1840's and was used well into the mid twentieth century. Bausch & Lomb was one of the first optical companies to make frequent use of what was initially called 'Vulcanite'; it was later referred to as 'Ebonite'. Today Vulcanite refers to a mineral, not hard rubber. Bakelite was invented in the first decade of the twentieth century. It is seldom used today, replaced by more modern plastics. *'Tortoise Shell' is actually the outer protective casing of the Hawkbill Sea Turtle. The color of some of the magnifiers pictured on these pages have been darkened with use over time, making recognition of the material used difficult. Careful inspection with a bright light both directly and via transillumination reveals their primary material is in many cases 'Tortoise Shell'. Killing sea turtles for this material placed the Sea Turtle on the endangered species list and treaties now ban the collection or sale of this material. Importation of any item containing this material is now illegal with the exception of antique examples like the ones shown on this page. 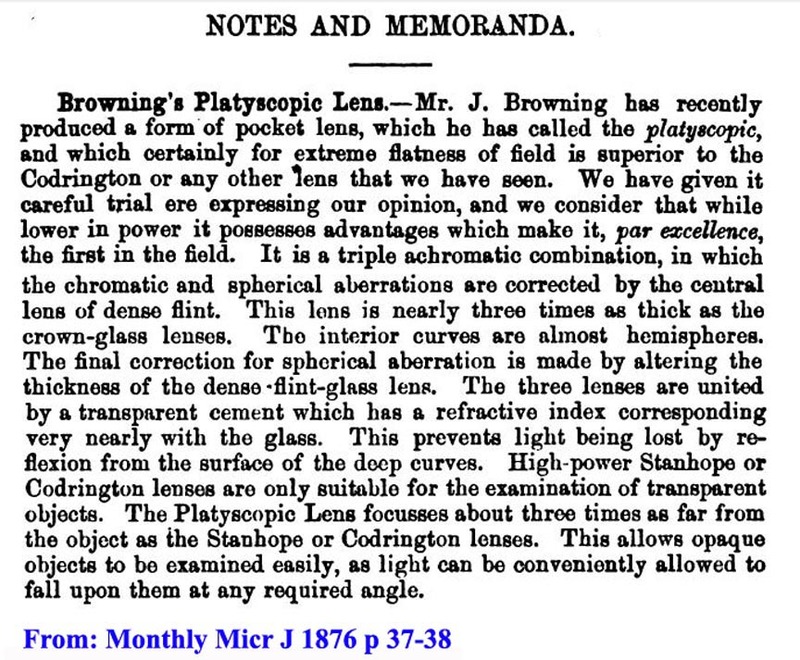 The author is indebted to Dr Joe Zeligs for providing many of the ads and catalog entries of the Browning Platyscopic Magnifier found on this web page.